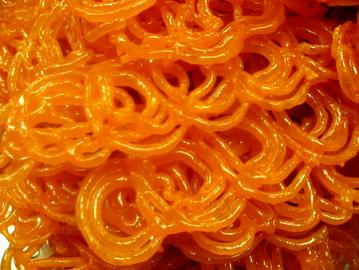 Jalebi is sweet sticky & crispy swirls and comes in orange or yellow color. It is one of India's most popular sweet. It is very hard to stop the temptation, once you start eating. Eat with a glass of warm milk or just plain. Major Ingredient: Fermented Flour, Sugar, Ghee, Corn Oil, Almonds, Pistachio, Saffron, Kewara Essence. Fresh Shipped Directly from our Kitchen. Store and serve at room temperature for best taste. If you prefer, you can also heat them in microwave for 10 seconds and enjoy them warm. Buy Jalebi - Orange Sweet Sticky & Crispy Swirls, 1 Pound, sold & shipped by Bengali Sweet House where you can shop online for Quality Indian Sweets, Snacks & Gift Baskets Shop - Bengali Sweet House. This Sweet Jalebi collection has been tagged as Indian Sweets, Festival Gift Box, Indian Mithai. It is typically shipped out in 1 business day via UPS ground from NJ. The transit time would depend on the destination.